Krispy Kreme has opened their second store in Perth! 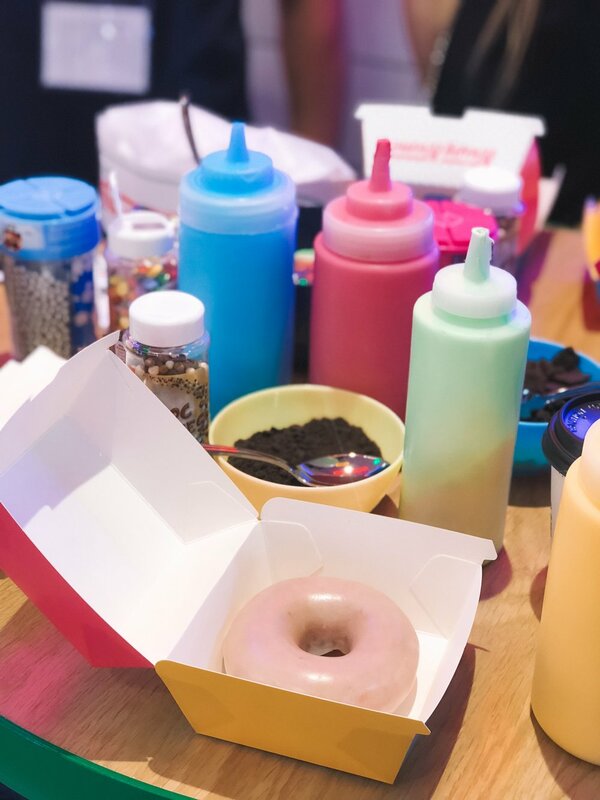 I was lucky enough to be invited to experience the Krispy Kreme VIP preview event on Tuesday 2nd May. The store is right next to Short Order Burger Co. and the Apple store, super easy to find! Plus, who doesn’t love a burger and doughnut combo. I walked through the door and was instantly met by smiling staff, obviously super excited to show us what they had prepared for us. We ordered a drink each, I asked for an iced chocolate and Benna had a coffee. We sipped away as we admired the huge display cabinet with doughnut in every colour, waiting patiently to be scooped up and eaten. We were allocated to a yellow group, matched up with others who arrived at the same time. We moved through the store in a group, experiencing the activities and chatting with the staff. After our drinks, we started at the back of the store. Decorated like an old school diner, inspired by that movie… I just can’t put my finger on it. I’ll think of it soon and edit the name in! With neon shapes and bright colours, I felt like I had teleported back in time to somewhere in the 80’s or 90’s. Nostalgia these is always my favourite, so you can imagine I was in my element. At this end of the store, we were presented with original glazed donuts and a lot of icing and decorative bits and bobs. Yep, we designed our own doughnuts! Admittedly, mine looked absolutely horrible and I realised it must actually be a pretty hard job coming up with the designs. At least it still tasted good. We moved back through the store and to the front area. Tables were set up with more original glazed doughnuts and there was a spread of decorative things awaiting us. Tash Kaur showed us how to make two types, I believe her job is a doughnut designer! We made the bright and speckled Krispy Kreme The Simpsons D'ohnut. It’s an original glazed, dipped strawberry flavoured pink choc truffle with with a salt bae application of rainbow sprinkles. Next up was the Vanilla Slice doughnut. Already filled with a smooth vanilla custard, we hand dipped them in a white icing. Next we created lines with ganache chocolate icing and used a toothpick like tool to drag the lines horizontally, creating the swirl decoration. We left the event with full bellies and a huge Krispy Kreme goody bag with enough doughnuts to last the week. Luckily I could take some into work the next day!